Based out of Silicon Valley, Zume Pizza uses robots to produce freshly-baked, artisanal pizza. With their new van, which contains on-board ovens, they can deliver their pizza to customers as quickly as four minutes after it was ordered. Founded in 2015, Zume was conceived of by Julia Collins and Alex Garden, who decided that automated cooking was the future of pizza, not reducing the cost of the ingredients. While store-bought pizzas are also made by robots, Zume is the only company to produce high-quality, customizable delivery pizza using this sort of technology. 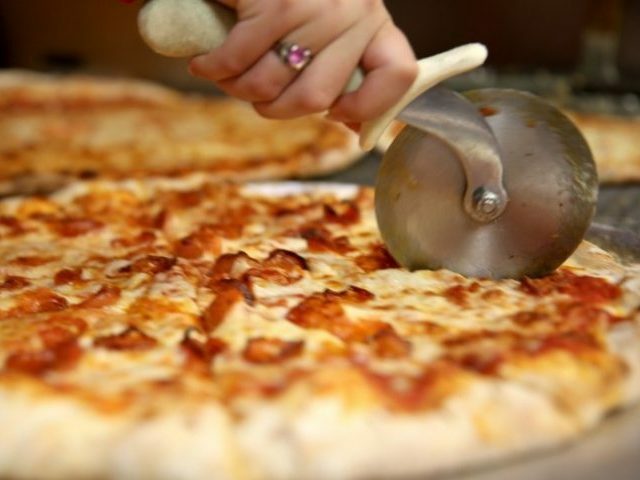 The pizza is produced at the company headquarters, which, according to Business Insider’s Melia Robinson, “looks more like a manufacturing plant than a restaurant kitchen.” Given its ability to pump out 372 pizzas per hour, this similarity is not surprising. The company partnered with ABB Robotics to create the “Rube Goldberg-looking contraption” that allows such high production speeds. After receiving the order from the customer via an app, the machine bursts into life. The first robot on the line is the recently-added Doughbot; this can create the pizza base from a doughball in 9 seconds flat. The pizza then moves down the conveyor belt to be covered in sauce by one of two dispensers, called Pepe and Giorgio. Marta, the sauce-spreading robot, then evenly distributes this across the base. At this point in production, a human is required to put on the toppings, the only section that is not automated. “Human beings are great at that step… When we think of the end-of-arm tools that we would need to pick up a cherry tomato and then a nugget of sausage, it’s hard to find tools that manage that much variety. We don’t have any intention of limiting variety to serve the robots. Finally, a robot called Vincenzo lifts the pizza into the oven to be cooked at 800 degrees for 1 minute, after which it is then sliced by Zume’s proprietary, self-cleaning slicer. Even the box it is delivered in is specially designed; rather than being a flat, cardboard box, it has sloped ridges and a dip in the center, ensuring the pizza won’t become soggy in transit. There are two other factors which allow Zume to really cut down their “dwell times,” as in the amount of time the pizza spends going from oven to plate. First off, they have a specially designed van, retrofitted to contain 56 ovens. If an order is within 12 minutes of the headquarters, the pizza is put in the oven partially cooked. When the van gets close to the drop-off point, the pizza will be cooked for 3 and half more minutes, ensuring it is piping hot as soon as the customer picks it up. Secondly, and what is perhaps even more impressive, is that Zume has created a software algorithm that can predict what sort of pizza people would want in a given area at a specific time. Trucks are pre-loaded with pizzas that it thinks will be in demand, allowing some people to receiver their pizza only 4 minutes after ordering it. “We’ve already guessed that you’ve wanted asparagus and ricotta pizza at 12:30,” Collins told the Washington Post. She explained that this was due to orders being habitual. The crust is thin, even by East Coast standards. I was disappointed by the way the slice flopped under its own weight. The dough’s flavor disappeared under the toppings. But, oh, what toppings. Thin-sliced pepperoni crunched with each bite, while the the mushrooms and peppers burst with juiciness. The cheese pulled apart like bubble-gum. The recipe wasn’t perfect, but quality pizza that’s delivered in under 20 minutes — and costs less than Domino’s — could make Zume a worthy competitor in the pizza arena.